Royal Mail is celebrating the end of Rugby World Cup 2015 with a special postmark congratulating the winners, New Zealand. Rugby World Cup 2015 was hosted by England for the second time – the first occasion being 24 years ago. Today’s Final at Twickenham was the culmination of 48 matches held up and down the country, over the past 44 days, from St James’ Park in Newcastle to Brighton Community Stadium. The winning of the Rugby World Cup is considered the greatest prize in Rugby and is one of the world’s most admired competitions. 20 teams from around the world competed to lift the Webb Ellis Cup, named in honour of the sport’s folkloric founder, English schoolboy William Webb Ellis. Andrew Hammond from Royal Mail, said: “Postmarks are used to commemorate significant moments in the country’s history. England being chosen as the hosts for Rugby World Cup 2015 is certainly something to remember. No picture was available with the press release email. And Mike sent the alternative layout used at Edinburgh. Mike pointed out that the wording at Edinburgh was different - but in fact the wording advised in the original email was wrong: (see below) the word 'to' is not included on the specimen shown above, either! Further update... Thanks to GW I can now show the other format (from Bristol Mail Centre) which does indeed include the word 'to', per the original email. Smartstamp was launched on 15 January 2004, and we wrote about it at the time. computer to print postage on their own envelopes or labels from the comfort of their own home or office. The software also provides complete details of postage rates and those for supplementary services, so that the correct values are printed, for any destination and weight selected. Test prints can be produced at any time but users need to be online to use the system, as prepayment accounts are debited as each impression or batch of impressions is printed. The system prints the value and a service indicator, a code number, and the date by which the item must be posted. Remember when 1st class postage was 28p and 2nd class only 21p?! I don't know how much take-up there was for the system, especially when the software was restricted to Internet Explorer, and initially could not be used on Apple's Safari or Mozilla's Firefox browsers. In September 2006 a new facility was launched which had no subscription, and would run on other operating systems and browsers, but still take-up was quite low. It's not clear whether the Royal Mail Online Postage system will also be ending. 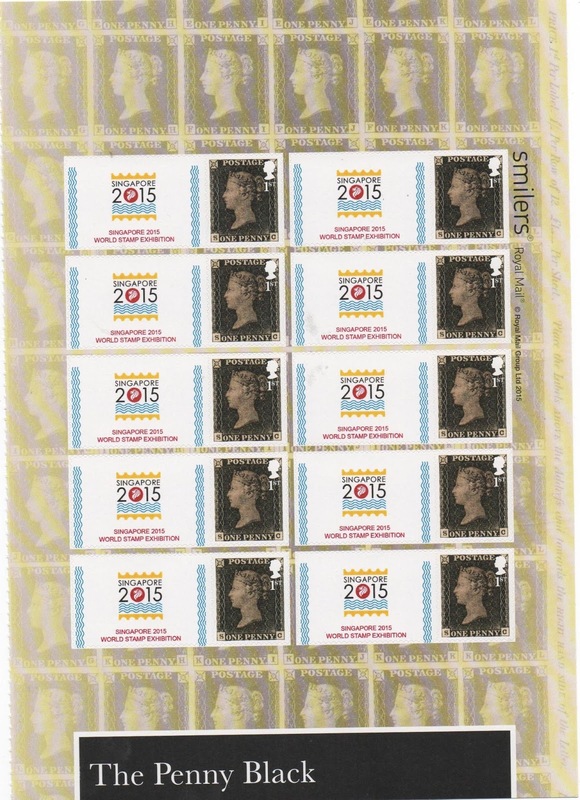 period by people producing 'scarce', 'rare', 'one-day only' thematic/topical postage slogans for sale on eBay. In fact, they were nothing of the sort: they could print them on demand, but they covered many animal, bird, sporting topics. On the other hand there were some genuine thematic slogans produced by organisations such as the Society of Olympic Collectors. "Despite most correspondence being via email, travel agencies are still posting tickets to customers." 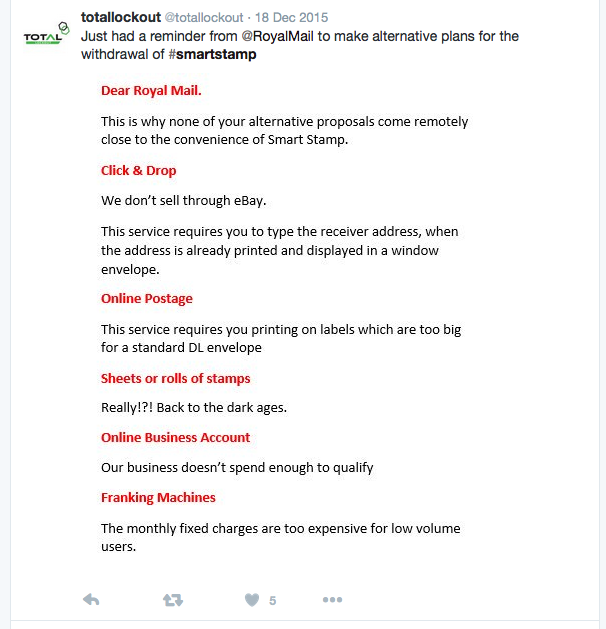 Royal Mail is replacing the system with various web applications when it closes Smartstamp on December 31. It claims the new systems could lead to savings but agents argue that the replacement system prints large labels where the address has to be added which can be very time consuming. Royal Mail said the SmartStamp system was now running on outdated technology which was not compatible with Windows 10, Mac OSX and other operating systems in use. A spokesman said: "We are supporting customer migration to one of our range of web applications such as Online Business Account, Online Postage or Click and Drop, which are more accessible and have better functionality across a range of platforms and devices. "Customers will see no increase in the cost of postage as a result of the change and may see savings, depending on their usage. "Over the next three months we will be working with all our customers that currently use SmartStamp to find a new solution which best meets their postage needs." It sounds to me like a classic case of Hutber's Law. Whilst many organisations will have upgraded to Windows 10 (especially if they tried using Windows 8) the main users of the system are reckoned to be small businesses, many of which tend to upgrade when they get new hardware, rather than just because a new buggy system is available, delaying their upgrade until the bugs have been eliminated. Of course Royal Mail also have an eBay/PayPal integrated postage-printing option, so this may have to change as well. There is nothing obvious on their website about the changes. Do you use Smartstamp or Online Postage ? Have you heard from Royal Mail about the changes? We need to let you know that SmartStamp will be closing down permanently on 31 December 2015. SmartStamp has been in existence since 2003 and has become outdated. The application is running on very old systems which cannot easily be upgraded to new platforms. The good news is that we have a number of alternative options, with improved accessibility, to keep you posting. 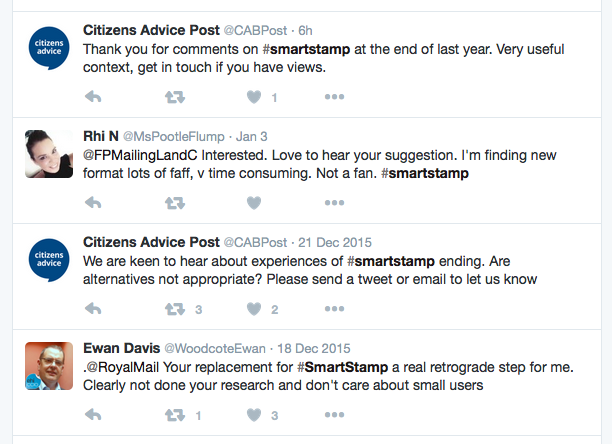 It’s important you consider and choose the right option for you before SmartStamp becomes unavailable at the end of December. Please take some time to consider the overviews below and then visit our website for more detailed information. Why not visit https://parcel.royalmail.com/ and join the thousands of customers already using this system today? Free access on multiple computers. Please visit www.royalmail.com/onlinepostage to see our full guide and work through 6 easy steps to post. If you spend an average of £20 a day, £100 a week, £400 a month or £5,000 a year, you could qualify for - and save money using - an Online Business Account. Find out more, including how to contact us, at www.royalmail.com/onlinebusinessaccount. Please visit www.royalmail.com/franking to learn more about the benefits of a Franking machine - and contact details if you need more help. UPDATE 9 December So although Smartstamp is ending, Online Postage - which is "much the same but better" - continues. The Travel Agents ought to find that just as useful! But they don't, as you can see from the comments appended below. 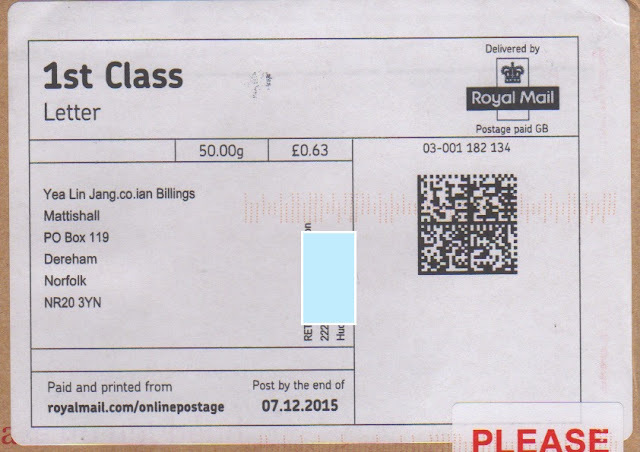 I've now received a c6 (board-backed) envelope with a new OnlinePostage label. Because this incorporates the address, weight and payment details, and Royal Mail's required new 2D barcode, it is of course much larger than the old Smartstamp. It also covers the pre-printed 'Please do not bend' so requiring another endorsement. Collectable? As postal history I suppose it must be, but postal history collecting is taking more and more space! Activity on twitter from disgruntled users and the consumer watchdog 'Citizens Advice' is asking for comments. That may be why - according to reports - Smartstamp is still working today. 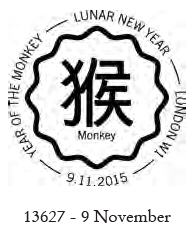 What can I print my postage onto? You can print your postage on to standard label sheets, DL, C6, C5, envelopes or A4 paper. To see all label sizes click on the ‘Easy Start ‘section on the homepage or ‘Edit print options’ on the create postage page. The Plug was finally pulled on 31 January 2016. You thought it was all over, but it isn't - Another 2012 Gold Medal Surprise ! 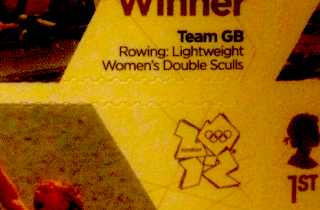 Since Great Britain hotsed the 2012 Olympics and overnight produced stamps for each British Gold Medal Winner, there have been a number of surprising 'errors' and possible misprints, reported here. 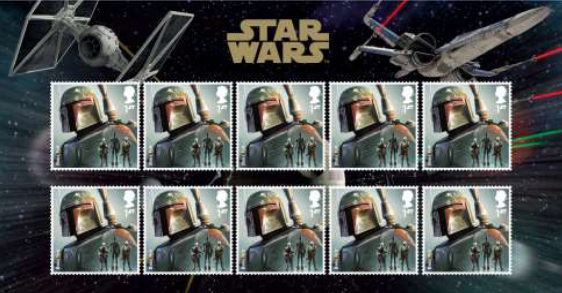 As regular readers will remember, the stamps were issued in miniature sheets of 6, printed on an A4 sheet of 4x MS, (and these were printed in press sheets of 4x A4). On eBay from seller 4chonts this is a roll of 1000 miniature sheets, each of 6 stamps, which are listed at £3,200 or 53p each compared with the 60p original price and current 63p value. 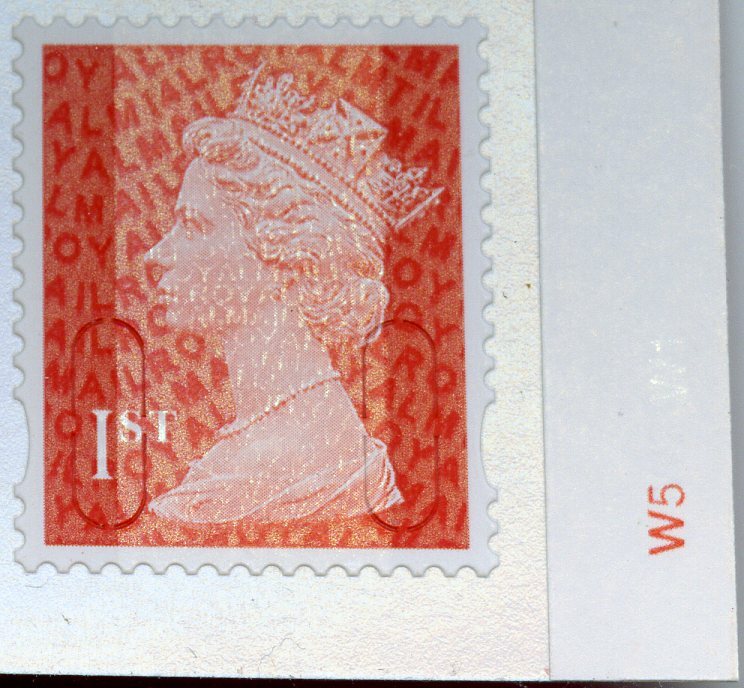 The stamp shown was the 10th in the series and one of the 6 issued on 5 August 2012. I suspect this is a roll that would have been printed for machine application to Royal Mail first day covers. Such coils are common, for self-adhesive definitives (which are printed in one multi-value coil, with sideways printing rather than N-S), and commemoratives including post and go issues. Royal Mail do not publicise this sort of printing and the stamps are not available to collectors or dealers (with one exception) but the system is well known. 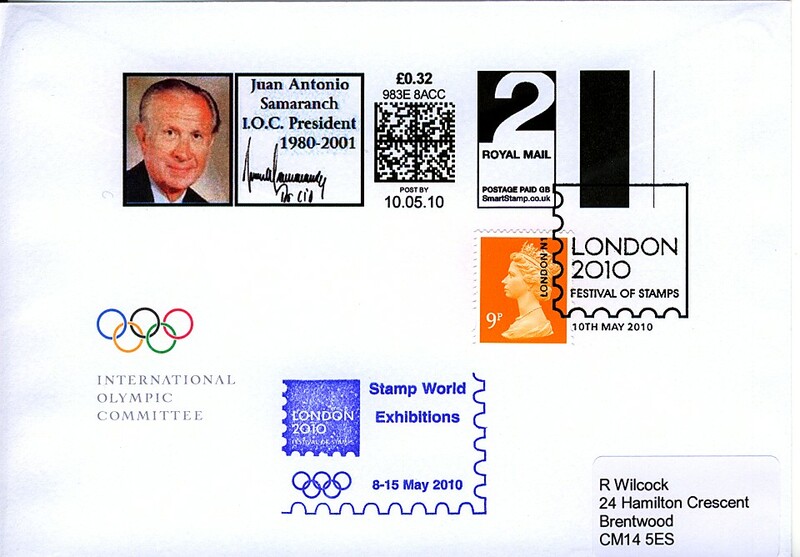 However, there was never any evidence that the Gold Medal stamps were produced in this way as well as by the 6 regional printers contracted to achieve rush-digitally-printed overnight delivery to Post Offices for sale the next day. Was this done for each medal, and for the paralympics? Were these coils supplied to Handstamp Centres, which normally carry small stocks of stamps in order to replace damaged or wrongly cancelled FDCs/cards? How many printers were involved? Was it any of the 6, or a different printer entirely? Where has this one been for the last three years? Are there any other gold medal coils ? ! Thanks to readers who have sent reports and pictures in the last couple of weeks. I now have time to provide an update report on some of the recent Post and Go happenings. But first, a trip to Singapore's exhibition. We reported in August that the Faststamps produced in the UK and at the exhibition were once again different, although this time the difference was confined to the year code on the stamps. Unlike in Australia, the additional inscription was the same from both sources, although it seems that both were in error, referring to the event as Singpex 2015 World Stamp Expo when the official name - which appeared on the exhibition logo - was Singapore 2015. Thanks to RW I can show a 'before and after' picture of the Union Flag stamps. The old one was bought on Thursday 15 October in session 2314, and the one with the expanded caption on Monday 19 October (the first day) from session 2321, so not much activity in between. Also the new MA15 Poppy with the expanded caption on the first day (19th October), and the pair used on cover. Mail from Yeovilton is handled by the Bristol Mail Centre. MC sends these examples from the National Museum of the Royal Navy. 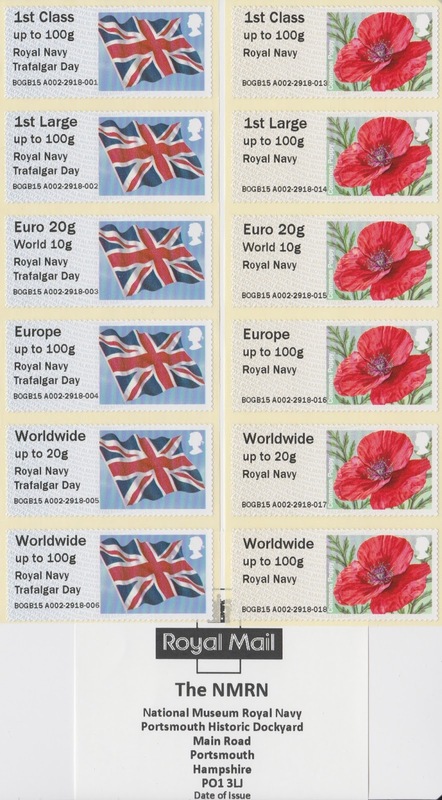 It hadn't occurred to me before that, by not including the word 'Museum', these have the appearance of overprints for official use by the Royal Navy on HM Ships etc! 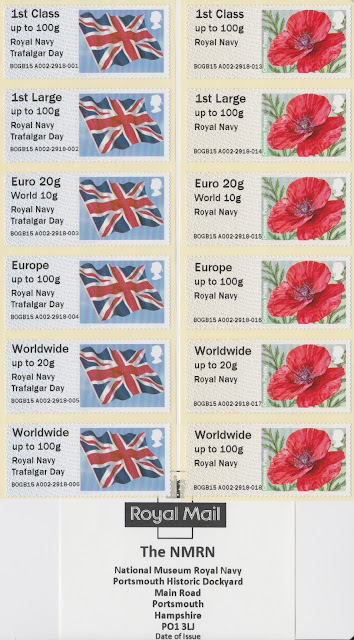 As publicised, the Union Flag also marks Trafalgar Day, and the Poppy stamps are MA15. As you can see, the receipt has both the abbreviation and the full title. It appears that even the Museums that were reported to be closed on Mondays would have at least the shop area open, so that collectors could obtain all their requirements on one day. Reports from the Marines and Submarine Museum are awaited. Thanks for the continued support - though I suspect there will be less to report in 2016 as many of you are saying that your Post and Go collections will be seriously curtailed by then! I suppose it's a measure of how much/little interest there is in these from collectors in the UK that examples from the other museums have not been supplied until now? If you have the Star Wars stamps and don't have an ultra-violet lamp, then you won't be seeing the features on the stamps issued yesterday that are invisible in ordinary light. As far as I know The Drum is the first to reveal this, which isn't in the publicity information that was sent out by Royal Mail to dealers. The earlier characters have different emblems in fluorescent white, some have the Alliance Starbird and others the Imperial Crest, as used on the first day of issue postmarks. 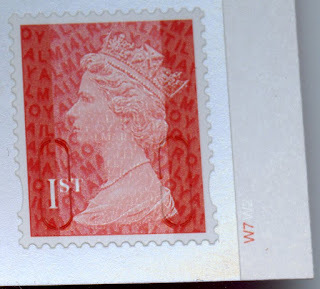 Some of these are quite difficult to see against the very dark colours of the stamp, suggesting that the fluorescent ink may be below some of the colours. There are no fluorescent marks on the miniature sheet, but the same marks are included on the Generic Sheet, and PSB panes. My thanks to reader Jarvis, and also to Davis and Alex at Royal Mail Philatelic Enquiries who provided him with this line-drawing of the fluorescent emblems added to the stamps. 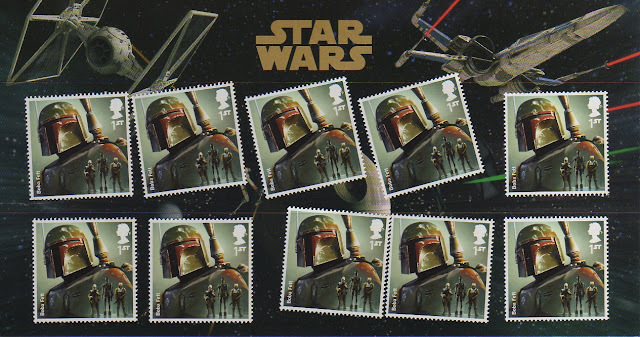 The arrangement shows the 12 stamps in the normal sheets. Star Wars - a bit of a let-down, but also a relief! Readers will recall that among the many Star Wars products (see our website) Royal Mail included 'Character Stamp Sets'. Without precise technical details we were not sure whether these would be strips of 5 or blocks of 10 - in which case they would have to be from different sheet printings, or whether they would be torn from the vertical strips of 5 that make up the counter sheets of 60. Although it looked like separate stamps, we can never be sure how accurate Royal Mail publicity pictures are. I'm pleased to say that the actual sets do not appear to contain stamps from a separate printing - although I'm willing to be corrected by somebody with better eyes or reliable information! 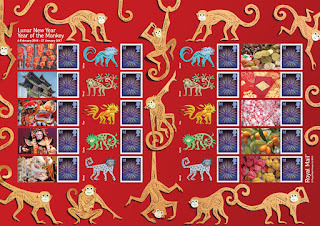 The fifth in the series, following on from the 2015 Year of the Sheep last year , Year of the Horse sheet in 2013, Year of the Snake sheet in 2013 and Year of the Dragon sheet in 2012. 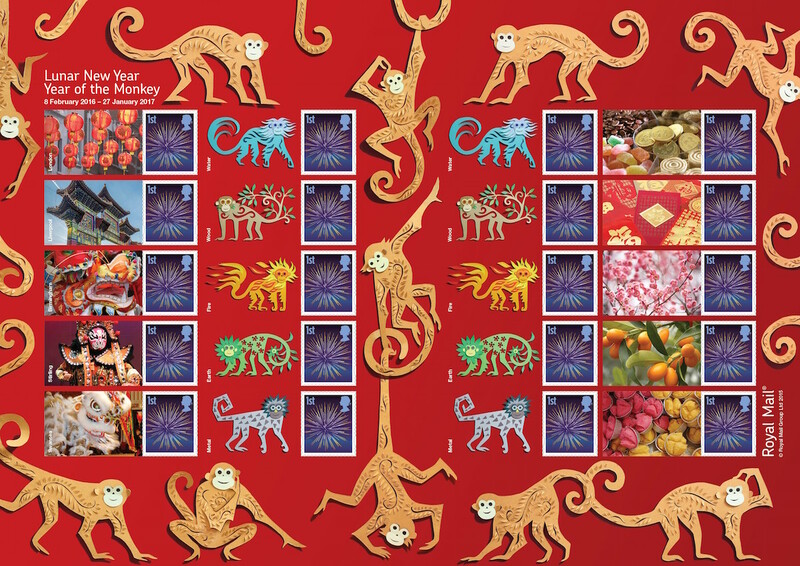 The sheet features 20 Firework stamps from the Smilers range alongside the five elemental Sheep types Water, Wood, Fire, Earth & Metal, celebrations of Chinese communities from around the UK and imagery associated with the celebrations. 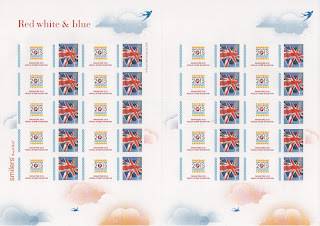 The special postmark is available for use on the day of issue from the London Special Handstamp Centre at Mount Pleasant.. It's been some years since Royal Mail abandoned all attempts to get Post Office Ltd to advertise new stamp issues in branches. There simply isn't enough space for an A4 poster among all the adverts for Holiday Money, Car Insurance, Current Accounts and other financial products. Imagine my surprise, then, to find a change of tack in our village branch this morning. I suppose I should not have been surprised given that Royal Mail want to maximise their income from this issue, but it was still a pleasant surprise. 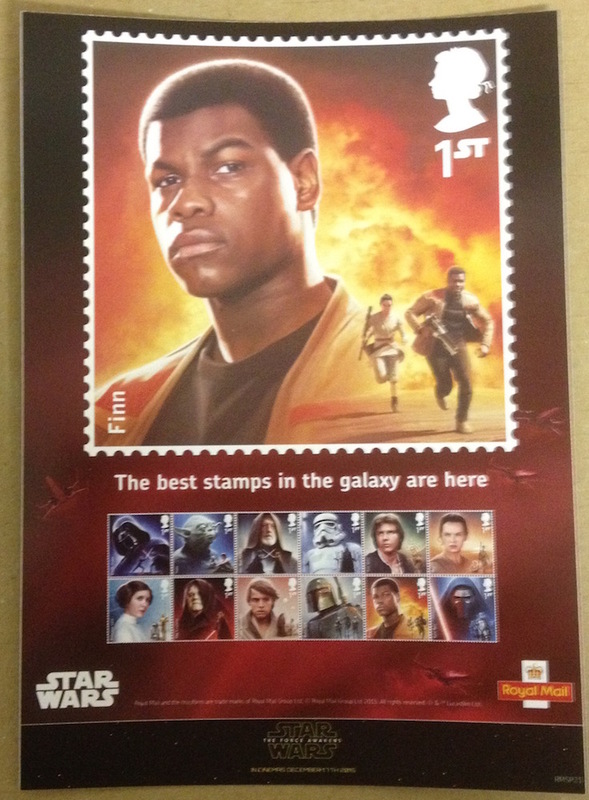 As you can see, the A4 shows the Rey stamp, and the A5 shows Rey on one side and Finn on the other. Are these the only designs, or would it be possible to collect a set of 12!? UPDATE: two reports of other similar material. Larger offices have free-standing 2m-high advertising material, probably similar to that used for the Andy Murray miniature sheet. There is also a double-side window sticker, which has adhesive on one side. This was reported from a Scottish island. I understand that some similar material has been listed on the eBay auction site, and that the sellers have been contacted by another eBay user (with zero feedback) claiming to represent Royal Mail's lawyers, and demanding that the listings be terminated. These are apparently genuine, although eBay has a well-established procedure (VeRO) for dealing with intellectual property infringement. It seems that the only reason for this demand is that the posters were not supposed to be sold or given to members of the public, rather than any actual copyright infringement. Perhaps somebody should have told employees of Post Office Ltd that these should have been destroyed if not used. Perhaps Royal Mail would have more credibility on this if they had taken similar action over the thousands of posters for stamp issues over the past 30 years or more that are in collections, listed on eBay, and the subject of a catalogue by a well known dealer in Presentation Packs and PHQ Cards.